This originally came from the NotesPeek help file (you can get NotesPeek from the Notes.net Sandbox) — I added information about DB IDs and Replica IDs, and the columns about Notes copies and OS copies of databases. The NotesPeek help file also provides a nice reference to what the different Note IDs actually are (check the Help Glossary for more interesting info on Notes internals). I’d copy that for you here as well, if I didn’t think I’d get in trouble for it. The C-API documentation also has similar information (C API User Guide, Appendix 1, “Anatomy of a Note ID”). This knowledge can come into play if you’re relying on one of the Notes IDs to be a reference number to a Note, like if you’re synchronizing information between Notes and a relational DB. Based on this table, the Notes UNID is the only thing that will remain constant across all replicas and copies of a database (watch out for the copies!). One related little tidbit from the NotesPeek help file: the term “UNID” is supposed to be pronounced “un-I.D.”, as in “try to UNderstand your I.D. file”. I always thought it was pronounced “you-nid”. Shows you what I know. I probably pronounce Linux wrong, too. NOTES.INI setting. Logs to the console whenever a Notes client establishes a session with the server. Tells you who the user is, and on R5 also tells you what version of the client they’re using. Console command. Displays a little more information about the Notes client users who are currently logged on. Console command. If session-based tracking is enabled on an R5 server, this command shows the web users who are currently logged on. Enabling HTTP logging allows you to track the hits that your Domino web server gets. You can either log to a database (DOMLOG.NSF) or a text file, and while the DOMLOG database is sometimes easier to get quick stats from, the text files take less server resource and are easier to archive. I generally like to log to text files, especially because I’ve had several instances of my DOMLOG database getting corrupted. There are also a lot of tools available to analyze the text files, since they’re in a standard web server log format, so you have good reporting options for the boss (see the accesslog database on this site for more information). If you change any of the logging settings, you have to restart the HTTP task for them to take effect. Because the log files can start taking up a lot of space after a few weeks or months, you should make sure you keep an eye on them, and zip up or delete the old log files regularly (you can do this with an agent or a batch file). This should cause the HTTP task to create a number of REQ###.LOG files in your Notes Program or Data directory (depending on your OS). There will be a separate file for each thread that the HTTP server uses. These log files can grow large very quickly, so you should automate the process of either deleting or archiving the REQ###.LOG files every night (after the files are deleted they will be automatically recreated, so you can even do it in the middle of the day if you want to). Also, here’s a link to some good information on HTTP Thread Logging/Request Logging in ND6, from the IBM site. If you have any tools to determine what process is using that DLL (like Process Explorer from SysInternals), you may notice that the WINLOGON process is the one using the DLL. Unfortunately, you can’t really kill the WINLOGON process and expect your server to operate properly, and without killing the process, you can’t delete, move, or rename the JS32.DLL file. The problem is that NoteStat (the Notes Performance Monitor extension) is running, and it attaches to JS32.DLL. So why would WINLOGON appear to be using that DLL? Well, it turns out that Windows NT architecture stipulates that any extensible performance counters added by a service will run in the context of the WINLOGON process. NoteStat is a Notes performance counter, so that’s what’s going on. To fix this problem, run “unlodctr notestat” at the command line, and try again. In some cases, you’ll have to remove NoteStat from the registry (Notes KnowledgeBase Doc #174802) and reboot for the installation to run successfully. And when you’re reinstalling, do yourself a favor and do a Custom install with “Notes Performance Monitor” unselected — unless you really feel like you need it. Here are some command-line options you can use when starting the Notes client. Many of these were taken from docs in the Notes KB. Substitute the path for your Notes.exe file for “C:\Notes\Notes.exe” in the list below. You can leave the server name blank (so the protocol starts with notes:///) if you want to access a local database, view, etc. The LDD site has a downloadable form you can use if you want to report a bug in Notes. However, the form is in WordPro format, and I know that lots of people (even us Notes users) don’t have SmartSuite handy. Well I do, so I converted the form to MS Word format, in case that’s better for you. Please visit the link above for instructions. I mentioned this in one of my blog entries, but I figured it should live here in the Tips section, too. The $FormulaClass field in a view determines what types of documents show up in the view. Normally, the documents that show up are regular note documents, although if you modify the $FormulaClass field in the right way, you can also make design elements show up in your view. you will always get the “About This Database” document, if one exists. Now, getting some of these elements as Notes documents may not do you a whole lot of good on the surface, but some of them hold interesting qualities (as coding superhero Rod Whiteley mentions in this post on LDD, the database icon can hold many strange and random bits of information — search for the “Icon note item names” section in STDNAMES.H). A few years ago, this post on the Notes.net forum (now the LDD forum) outlined a way to pull all the debug flags from the various Notes DLL and EXE files. Virtually all of these flags are undocumented and some may not be useful at all, but it’s pretty neat information anyway. The resulting file (nDebug.txt) should give you the same debug flags as the PERL script does, plus a couple extra ones (the PERL script actually searches for “DEBUG_”, and I searched for “DEBUG”). Again, most of these flags are totally undocumented, so all you can do with the resulting list is experiment. The DRC Consulting site may have some information to help you out — there’s a good list of NOTES.INI settings there. (Updated text) I’ve tried this with both the “findstr” command (on Windows NT/2000) and the “find” command, which should be equivalent in this case. It looks like “find” produces more results on my NT box. I have no idea why. Here’s a database I wrote with some code that allows you to export the information in a Notes rich text field to an RTF file, while retaining most or all of the rich text field formatting. It also demonstrates how to write multiple things to a single RTF file (including multiple rich text fields), if that’s something you’re interested in doing. Additionally, the techniques involved should allow you to export rich text fields that are greater than 64k in size. UPDATE: on January 1, 2004 I added functionality to allow you to export an entire Notes document to an RTF file, in addition to just exporting the individual fields. Please be aware that Notes doesn’t always do a good job of converting documents from Notes format to RTF format, so documents that have a lot of tables on them (for example) may not export perfectly. The function I wrote that lets you export a document also allows you to specify an alternate form to use for exporting though, so you can always design a special form to use just for sending the doc to RTF. The RTF file format is the one supported natively by Microsoft Word, so this can also allow you to create your own Word documents from Notes without even needing to have Word installed on your machine! For more information on the RTF format, please check the search engines. Microsoft used to have the version 1.4/Word97 spec available as the file GC0165.exe, although the last time I looked I could only find it buried in the GC1039.exe file here. At the time of this writing, you can also download the version 1.6/Word 2000 spec as the W2KRTFSF.exe file here. This database was written and tested on an R5 client, and it uses a possibly undocumented API call to “ExportRTF” (which I first saw in this post on the LDD forums). I have no idea what other versions of Notes it will run on, or whether or not this is supported functionality. It is much faster than using OLE to make calls to the Microsoft Word objects to create a DOC file manually, though. Okay, this one’s not really encryption in the sense of securely transforming data into something illegible, but it’s a good place to start. Base64 (described in RFC 2045, among others) is a “classic” way of encoding binary data into text strings, and it’s been used for transferring e-mail attachments for years. It’s also used in conjunction with things like basic HTTP authentication and PGP signatures. The ability to encode and decode Base64 data is a good thing to have in your toolbox, because you’ll run into it in lots of places. MD5 and SHA-1 are one-way hash algorithms that allow you to (essentially) garble text in such a way that it’s very difficult to unscramble. While it’s not encryption in the sense that it can be decrypted, it’s useful for storing things like passwords (think about the Internet passwords in the Notes NAB, or PIN numbers for your ATM card). You can find a full implementation of the MD5 algorithm in the Riddle.nsf database, which is zipped up with the sample databases from LotusSphere 2000 Presentation AD106: LotusScript Tips and Techniques Samples (I originally mentioned this in my blog). It was written by Damien Katz at Iris/Lotus/IBM, and it’s good solid code. I’m not sure that I can re-post the code here at this site, so please use the links to get to it. I do have a LotusScript implementation of SHA-1 that you can download here, though. It’s an adaptation of a VBScript implementation written by one Ray Harris (I originally saw the reference at this post on the LDD forums). I did some optimizations to his original functions to make it quite a bit faster. AES Encryption, which was actually “Rijndael” Encryption before it was adopted as the AES standard in the U.S., is a symmetric encryption algorithm that supports reasonably large key sizes (like 256-bit). This is more of what people think about when they think encryption, because it can be used to both encrypt and decrypt data. I don’t have a LotusScript implementation of the whole algorithm, but I did find a place where you can get both a C-implementation and a Windows DLL that can be called from LotusScript. That’s probably faster anyway. You can either get the code and the DLL from Brian Gladman’s page, or you can download the DLL here (the AesScript.zip file below), along with an example of how to call the DLL from LotusScript. Please keep in mind that I’ve only done some light testing with this DLL, so I can’t speak for it’s total reliability. Also, if you’re on a non-Windows platform I guess you’ll have to download the C code from Brian’s site and compile a library on your platform. At least it’s available out there for you, though. By the way, if anyone does anything with this on other (non-Windows) platforms, please send me a note — I’d like to know how it works. Here’s a Java class that allows you to extract the LotusScript elements from a DXL document that’s been created using the tools and functions in the Lotus XML Toolkit (available in the downloads section of the LDD site). When design elements are exported to DXL, agents and script libraries that contain LotusScript have the script Base64 encoded. This program finds all the LotusScript elements, decodes them, and writes the decoded script to either the console or a text file. It’s a good example of how to decode Base64, as well as how to recursively search through elements in an XML document. For XML parsing functionality, I’m using the open-source JDom package and the Apache Xerces package (Xerces is included with the JDom distribution). Make sure these things are in your ClassPath when you compile and run the program. Additional information about the way this Java class works are included in the source code. Update: there are now two versions of the class that you can look at/download. DxlScript.java is the original code, which uses JDom to parse the XML. DxlScript2.java is a new version, in which I modified all the methods to use native Node functionality to parse the XML (which allows you to paste the code directly into a Notes agent and use it from there without having to include any external packages like JDom or Xerces). This is an R5 Notes database that contains some sample Java code to help you start using Java in your Notes applications. It’s got code snippets, methods, reference information, and a few Java agents that might serve as good examples. It’s also a good framework for keeping track of your own Java code and tips. Here’s a LotusScript script library that has functions to convert raw LotusScript code to formatted HTML — useful if you’re posting your code on the Internet or in an e-mail. By default, it will attempt to format the code using a color-scheme similar to that used by the Notes/Domino Designer IDE, although you also have the ability to define your own custom styles for the output. I just updated the keyword list to include new classes and functions in ND6. Please tell me if I missed anything. Also, you visit some online databases that use this code to convert your LotusScript on the web at Joe Litton’s site and Chris King’s site. I actually came up with the technique a while ago, but never really did anything with it. Maybe you’ll find some good uses. Instructions and source code comments are included in the database, although it’s really pretty simple once you start looking at it. This is a Java class you can use in your Notes agents and libraries (or stand-alone applications, if you choose) that allows you to use a Notes RichTextItem as a standard Java OutputStream. There are also some additional convenience methods that let you use styles and write entire InputStreams and the like. The entire code is JavaDoc enabled, so usage should be fairly straightforward. This is an agent I wrote to parse the HTML tags in a String, keeping a set of “desirable” tags (like <b> or <i>), and converting all the rest by changing the angle brackets to their HTML equivalents (“<” becomes &lt; and “>” becomes &gt;). There is also some logic for automatically converting http:// references to <a href> links, and converting linefeeds to <br> or <p> tags. I originally wrote this as an experiment in parsing blog comments, so you could easily allow certain HTML tags in the comments, but there are probably plenty of other uses as well. If you decide to use this on a production system, please add some error checking! Also, you can find code that performs similar tasks by Colin Williams, Laurent deWalick, and Dave Meehan. If you make changes to a script library, it’s sometimes difficult to know when you have to recompile all the agents that call the script library and when you don’t. Here are some observations I’ve made. If you change the signature (i.e. — the name, the parameters, or the return value) of a function, sub, or class method, you have to recompile. I think the reason why the old constants stick around is because when the LotusScript is compiled, the LotusScript bytecode contains the translated value of the constant, not a reference to the constant. This is good programming as far as bytecode optimization is concerned, but bad if you change the constant in the script library, because the agent never looks back at the script library to check the value of the constant. You’re okay as far as changing code in the functions and subs in the library are concerned, because I think the bytecode just contains references to their signatures, not the content of the functions/subs themselves. In other words, whenever an agent wants to run a function or a sub from a script library, it always runs it from the script library. So if you change the content of a function or sub in a library (and leave the signature alone) and don’t re-save your agent, your code changes will still be recognized. Here’s a little trick for using constant values in script libraries. The Initialize sub of a script library runs before the Initialize sub of an agent. Because of this, you can always make a script library variable global (but not Const) and then set the value of the variable in the Initialize section of the script library, instead of setting it as a Const value. This will allow your script library global variable values to be propogated to agents even if the agents aren’t resaved/recompiled. Be careful doing this with nested script libraries, though (where one script library uses another one), if the libraries need to call the global variables in their own Initialize scripts — nesting can get strange sometimes. If you don’t recompile all your agents, then they’ll get “Cannot find external name: RETURNNUMBER” errors if they try to call the function. This may have been fixed in ND6…I haven’t tried it there yet. Interestingly enough, if the method already existed in the super class and then you just decided to override it, no recompile is necessary, and the overridden class is used. This is a database that has some examples of how to write simple games using a Notes database. Well okay, there’s only two games in there right now (Tic-Tac-Toe and a dice rolling game), but I’m trying to be optimistic about adding other games in the future. The examples are pretty basic, but it should give you some ideas of your own, and show you some examples of how to interact with a user without having to save all sorts of data to the database. I wrote and tested this using R5. I have no idea how well it works with other versions of Notes. Here’s an agent you can use to export the documents from a Notes database that’s been built using the Microsoft Office Document Library template. When you create a new Office document in an MS Office Library, the document is stored as an embedded OLE object. This makes it easy to edit in-place, but it also makes it difficult to programmatically move the Office document somewhere else. The answer is to use OLE to open the embedded Office document in the background and save it to a file, and then store the file wherever you want it. In the example below, I used this technique to save the selected documents in an MS Office Library to another database that uses the regular Document Library template. The script should be easy to modify for your own purposes. This database has a script library that describes a technique allowing you to get the contents of a regular Rich Text field as MIME/HTML, even if that field isn’t set to store contents as MIME. There is also a function that will allow you to convert the contents of an entire Notes document as MIME/HTML using the same technique. This does not require any extra DLLs or special configurations. While it works with R5, you should really use ND6 or 6.5, because R5 has a bug that truncates large MIME parts like graphics. Also, the MIME/HTML that is produced is the same as the HTML that would be produced if you sent the rich text or document as an e-mail, which may be slightly different than the HTML that is produced if you rendered it on a web page using Domino (notably, some elements like buttons won’t show up). See the database and code comments for more detail. 4. [OPTIONAL] Right-click the attached file (which should have an icon like a stereo speaker), and choose the option “Object Properties”. Give the object a descriptive name. As far as I know, this will only work on Windows machines, and I’m not sure what happens if you have another application registered to edit WAV files. This technique should also work if you embed a WAV file onto a form (as opposed to attaching it to a rich text field on a document). And as a general technique, it’s a common way to access and make calls to embedded OLE objects on a form. If you want to see all the “verbs” associated with an embedded object, you can use the Verbs property of the NotesEmbeddedObject class (as described in the Notes Designer Help). In this way, you can use it as an Active Desktop component or a part of a web page. See this blog entry for more details. This is a LotusScript class that converts CSV files to XML. You can also use it as a basis for parsing CSV (or other types of delimited files) directly. Here’s a class that produces strings of valid character types, as defined in several places in the official XML spec. You can use these strings to check the validity of the characters in a string that you might be processing. This is a class that provides minimum StringBuffer functionality in LotusScript. It’s much more efficient to use this technique when concatenating a large number of strings than it is to simply combine them all together. I’ve lightly tested the code in Internet Explorer 6 and Mozilla Firefox. I have no idea how well it works on other browsers. Have you ever set up a repeating event on your calendar in Notes and thought to yourself, “I sure would like to use that functionality in my custom applications”? I have, and I spent a lot of time trying to figure out how it all works. Essentially, there’s a hidden LotusScript class called NotesCSEventOwnerDocument that generates the list of repeating dates, based on rules that are specified in the dialog box that allows you to choose your repeat rules. This class is undocumented and probably completely unsupported outside of the standard Notes calendar, but it’s such nice functionality that I did a lot of experimentation to try to understand it. The database below is the result of my “hacking” efforts. It has a modified copy of the (RepeatForm) subform from the Notes 6.5 iNotes.ntf template, free of dependencies on external script libraries and with example usage; a slightly more modified copy of the (RepeatForm) subform that you can use inline directly on your forms (instead of as a dialog box), also free of dependencies on external script libraries and with example usage; and a script library and two agents that describe how you can use the NotesCSEventOwnerDocument class in your backend agents, completely separate from any forms or documents in the UI. I will warn you again that this is undocumented and unsupported functionality, so please test first and use at your own risk. At times, e-mails you receive from users of Outlook/Exchange will be plain-text messages with a large attachment at the end called either “Winmail.dat” or “ATT0001.dat”. The reason why this happens is described fairly well in Microsoft Technote 241538. However, you as a Notes user must now do something with that .dat file, especially if there are file attachments trapped inside. While there are stand-alone freeware and shareware applications that will read those files for you (as long as you save the file to your hard drive), I wrote a Notes agent that you can use to extract the information from the .dat files right from your mail file. You just add it as an agent that runs against “selected docs” in your mail database, and it will convert the .dat file and make a new copy of the message in your Inbox with the extracted files attached at the bottom. You can download the agent code below. 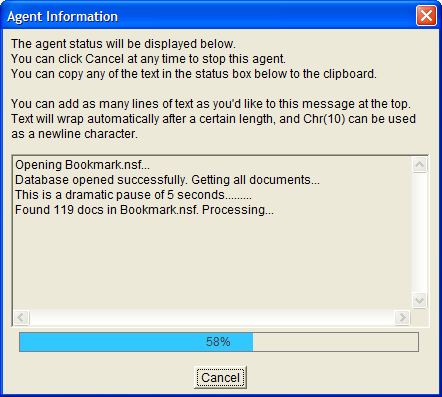 Instructions for setting up the agent are in the code comments. Please note that this agent makes use of the open-source and GPLed JTNEF library by Amichai Rothman. Please visit his site if you have any questions about the underlying TNEF conversion code, or the licensing of his library. An agent that makes an FTP connection to a server, lists files and directories, and downloads a file. Using LS2J for this type of thing allows you to perform multiplatform FTP client operations (without relying on LotusScript calls to Windows DLLs). An agent that allows you to use regular expressions in LotusScript. I wasn’t intending to teach you how to use regular expressions if you’ve never used them before, so I kept the examples reasonably simple. An agent that can resize, rotate, and otherwise manipulate JPEG image files. It also has an example of how LS2J can allow you to use Java multi-threading in LotusScript. This database demonstrates how to use XmlHttp requests to make dynamic lookups on a Notes web page, using the same technique that is found on the Google Suggest page. I made heavy use of Chris Justis’ Google Suggest Dissection article in writing this example code. While you can access the unread docs in a view using a front-end agent that runs against “All unread documents in a view”, there doesn’t seem to be a good built-in way (as of Notes version 6) to access them from a backend agent, or an agent that isn’t running in the context of that specific view open in the Notes client UI. The following class will return an array of NoteIDs for all unread docs in a view/folder or database, using the C-API. It’s a subtle difference, but sometimes you want one thing to happen and sometimes you want the other. If you want to add a button to a Notes Rich Text field using LotusScript, a common technique is to create the button manually ahead of time and save it all by itself in the rich text field of a profile document, and then copy and append the pre-created button whenever it’s needed. While this works well if the label or the underlying code of the button is static, it’s not a solution if you need to dynamically change the label or the code at the time you’re adding the button. Below is some code for a class that will allow you to create and append buttons to a NotesRichTextItem, with the ability to specify your own custom LotusScript or @Functions at runtime. It uses DXL to create the button on a temporary document first, and then the new button is copied over. The code should work on Notes 6.5 and higher. This is a technique for creating a singleton (one of the classic GOF design patterns) using LotusScript. The trick is, if you declare a class as PRIVATE in a script library, it’s not accessible outside the library. However, if you have something inside that script library (class method or function) that returns an instance of that Private class as a VARIANT, then suddenly you can call all the methods of that PRIVATE class and use it just like it’s a regular Public class. The examples are all in LotusScript because that’s what most people seem to understand, but it’s trivial to move the code over to Java if you’re so inclined. All of the comments and explanation about the code are either in the agents themselves or in the JavaDocs that are packaged with the ZipFileManager JAR file and source code, which is included in the zip file that contains the database and is attached to the “About this Database” document as well. The SelectedDocsList class provides a way to programmatically access the list of selected docs in a view that’s currently open in the Notes client (open in a tab, a frame, or as an embedded view), without relying on an agent to be running against “Selected docs” in a view. I originally wrote this to get a handle on the docs that were selected in an embedded view on a page or form. Please note that it does not seem to work on embedded views that have a selection filter applied — I have no idea why. Please see the code itself for more comments and information.